Where to go for the best views of Montreal's skyline? In a city crowned by a mountain with three peaks sprawling across the center of town, options are not lacking. The following locations offer several vantage points with panoramic views of Montreal's best-known landmarks, spots conveniently accessible by public transit. The lookout each local hikes to at least once, Mount Royal Park proposes vistas in every direction, the most popular being the view at Kondiaronk Lookout. Believe it or not, the tallest point in Montreal—the only point taller than Mount Royal—was made possible by an illiterate saint associated with thousands of unexplained healings on its grounds. More than a few marriage proposals have been uttered on its lookout too. Unsurprising, really. St. Joseph Oratory's lookout features one of the most epic sunset views in Montreal. Consider dropping by the Oratory in the afternoon or early evening to get the opportunity to both visit the Catholic pilgrimage site and watch the sun go down. Conclude (or prelude) the experience with one of the best smoked meat sandwiches in Montreal at Snowdon Deli. It's a 15-minute walk or short cab ride away. For a choice 360-degree view of the city, visit downtown Montreal's Au Sommet PVM, an indoor observation deck 188 meters (617 feet) above street level, on the highest floor of Place Ville-Marie, a downtown shopping center and office building connected to the underground city. Catch a sight of Montreal in all directions while learning about the city's most important landmarks guided by an interactive exhibition on-site. Admission fees apply. Then order a few drinks and a meal at Les Enfants Terribles, the highest restaurant and terrace in Montreal just two floors below. The menu is chock full of haute comfort food like pimped-up mac and cheese, grilled meats, tartares, vegetarian dishes and more. A new addition to the Old Port since September 2017, the Old Port's observation wheel provides 360-degree views of Montreal year-round, reaching heights of 60 meters above the shoreline. That's 197 feet, about the height of a 20-story building. Overlooking Old Montreal, downtown, Parc Jean-Drapeau, and key landmarks like the Biosphere and Olympic Stadium, observation wheel cabins are air-conditioned in the summer and heated in the winter. Admission fees apply. It's but a handful of feet higher than shoreline, yet the skyline view from the Old Port boat spa Bota Bota is spectacular. 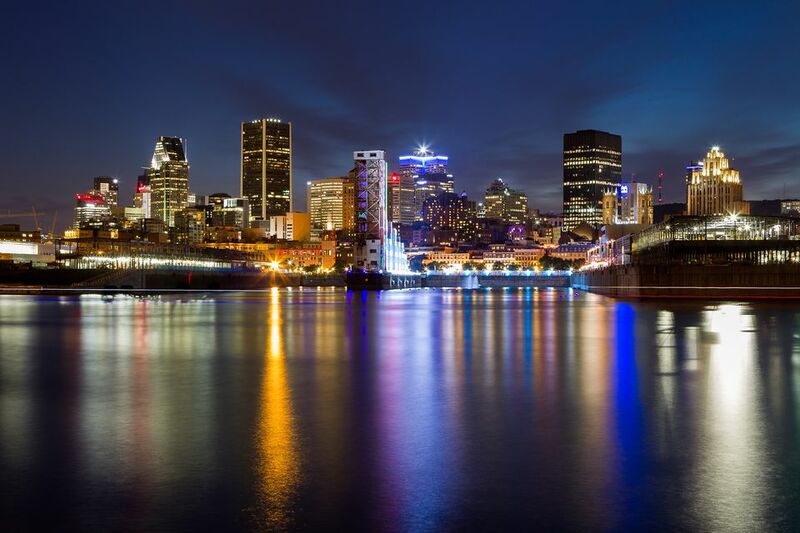 Spend the morning, afternoon, or evening getting a massage and moving through the water circuit fashioned in the spirit of traditional Nordic baths, pausing every so often for a view of abandoned industrial buildings to one side and Old Montreal to the other. Bota Bota isn't one of Montreal's top spas for nothing. Open year-round, including in winter months. Located near leading attractions like the Botanical Garden, the Insectarium, the Planetarium, and the Biodome, the Olympic Stadium's Olympic Tower is 165 metres (541 feet) high with a 45-degree tilt, a much steeper angle than the Tower of Pisa's 5 degrees. Visitors reach the top of the tower with the help of the 8,000-tonne structure's glass funicular to score enviable views of the Montreal skyline. Note that Montreal Tower schedule and admission rates vary by season. Montreal isn't exactly teeming with rooftop terraces open to the public but of those which are, Terrasse Nelligan wins the prize. For one, it's heated, extending patio season by several weeks. And it feels exclusive up there. There's this sensation of being part of a private rooftop club, with patrons sitting face-to-face with the top half of Notre-Dame Basilica and other Old Montreal architectural gems across multiple directions with sights of the Old Port and the St. Lawrence River toward the southeast. Terrasse Nelligan is located atop Hôtel Nelligan, one of Old Montreal's most esteemed boutique accommodations. But you don't need to be a guest to head to the rooftop. The smoke-free terrace serves finger food as well as lunch, dinner, and weekend brunch. Order an Assassin (cognac, strawberries, basil, lime) and pair it with cheese and charcuterie platter while gawking at the sunset. Home to some of Canada's wealthiest citizens, Westmount is an independent municipality located on the island of Montreal west of the downtown core. And the bulk of its most impressive mansions are draped over Mount Royal circling Summit Park, the site of one of Mount Royal's three peaks, at a pinnacle of 201 meters (659 feet) above sea level. Perhaps the least conveniently accessed via public transit on this list, buses reach the area, but fairly steep uphill trekking is required to go all the way to the top of Summit Park where the Westmount Lookout is located. Mind you, there are other insider lookout nooks throughout Westmount. The more you explore, the more views you'll find. The Westmount Lookout at Summit Park is simply the most popular.